Located in Truckee in the California region Fickes features a terrace. 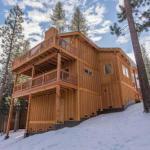 This property is 7 km from Northstar at Tahoe Resort. This holiday home comes with a seating area a kitchen with a dishwasher and a TV. The holiday home also features washing machine and a bathroom with a bath or shower. Summit Chair is 13 km from the holiday home while Chair #1 is 13 km from the property. The nearest airport is Reno-Tahoe International Airport 40 km from the property.